Chris Nash is relishing the resumption of his top-order partnership with Luke Wright as Sussex Sharks look to book their quarter final place in the NatWest T20 Blast. The 32-year-old has been used in various batting roles by Sussex in recent years but opening with captain Luke Wright is what he prefers. And the pair have been in sparkling form this season with two century stands already as they prepare to take on Hampshire at a sold-out Hove on Friday (7pm) knowing that victory will secure their place in the knockout stages for the first time since 2012 after a run of five wins in six games. They smashed an unbeaten stand of 116 off 74 balls in Cardiff to secure a record ten-wicket win over Glamorgan and bettered that by making 117 from 69 deliveries against the Welsh county at Hove seven days ago. Nash said: “We have both been in good form over the last couple of weeks. We like batting together and putting on big scores. It is nice to pretty much kill the game off with an opening partnership as you don’t want to make it edgy. 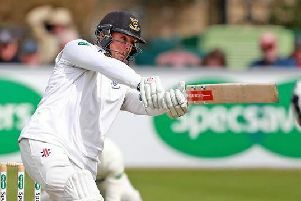 Wright has made 522 runs so far, with only Michael Klinger and Sam Northeast ahead of him, while Nash’s third half-century of the season against Glamorgan put him in the top 25 batsmen with 303 so far. Wright has also hit 26 sixes with only Chris Gayle clearing the ropes more often. By his own admission, Wright thinks the 101st England appearance he made in March 2014 could have been his last but Sussex are feeling the benefit from having him available on a regular basis. Nash added: “Wrighty is a brilliant player and has been for the last couple of years. We’ve missed him when he has been away with England in the past so to potentially have him for a full season is a massive boost for us. With no fresh injury worries, Sussex are likely to be unchanged against Hampshire. Sussex (probable): Wright, Nash, Machan, Cachopa, Bailey, Finch, Beer, Yardy, Robinson, Mills, Liddle.